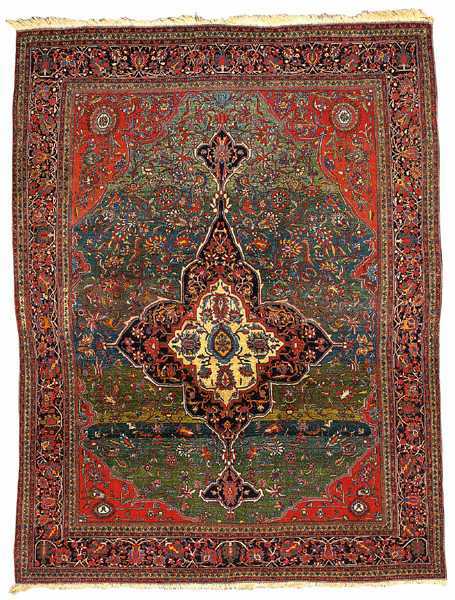 Farahan rugs were a very esthetically pleasing group. 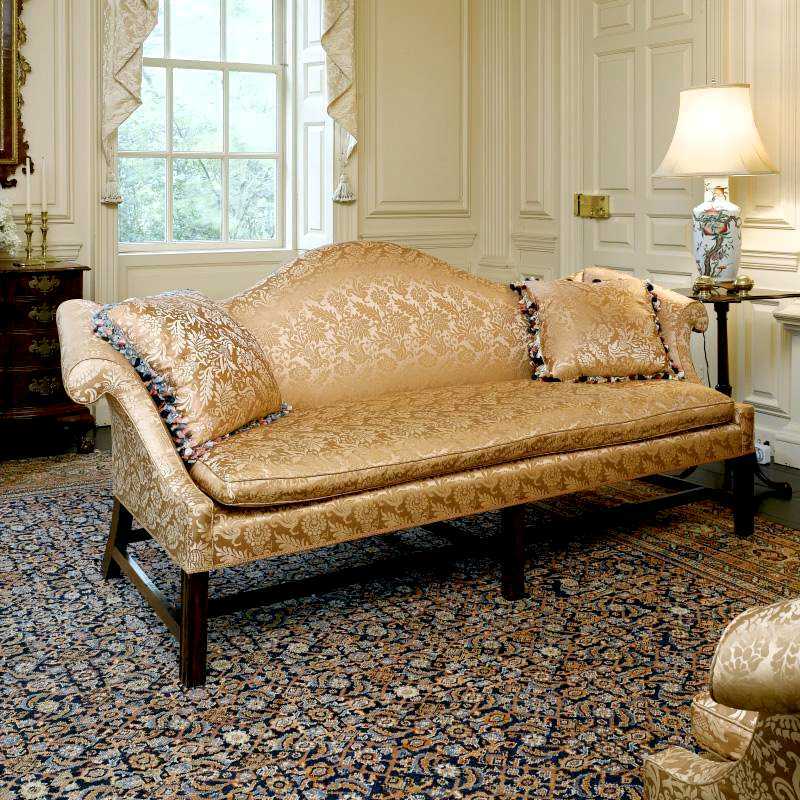 They drew upon a sophisticated design repertoire without the formality of a city workshop carpet. 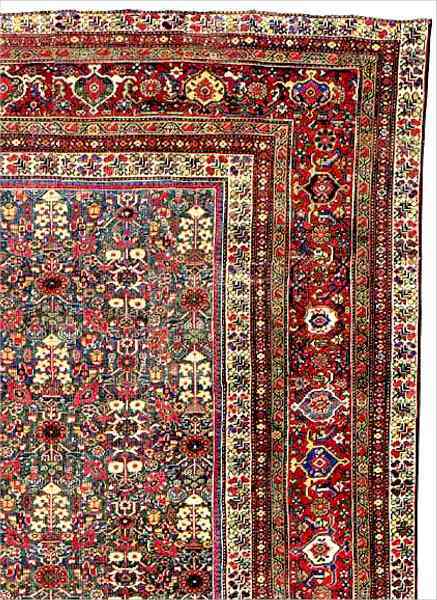 Technically there are a well made carpet and as a rule the dyes were very good. 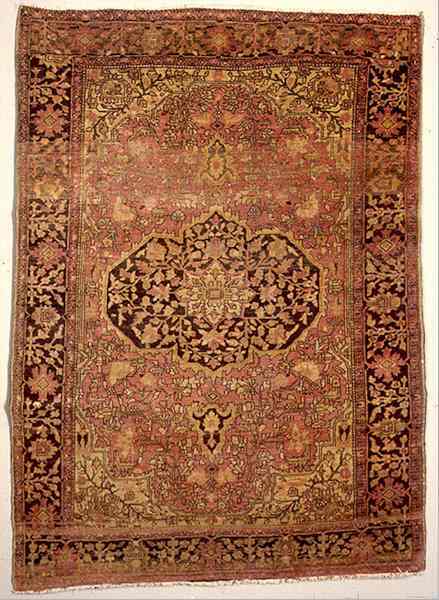 Farahan rugs often used a very attractive copper green called celadon after the Chinese pottery. It would turn brittle over timeand wear away leaving a sculpted look. Up until W.W.II these carpets represented the best of the Sarouk production. 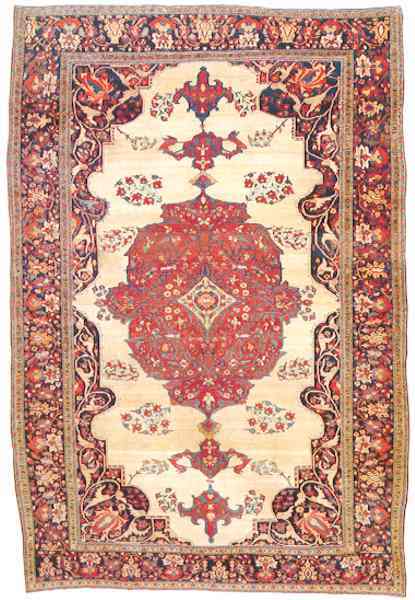 They were attributed to the village of Farahan but were likely made in a number of villages. 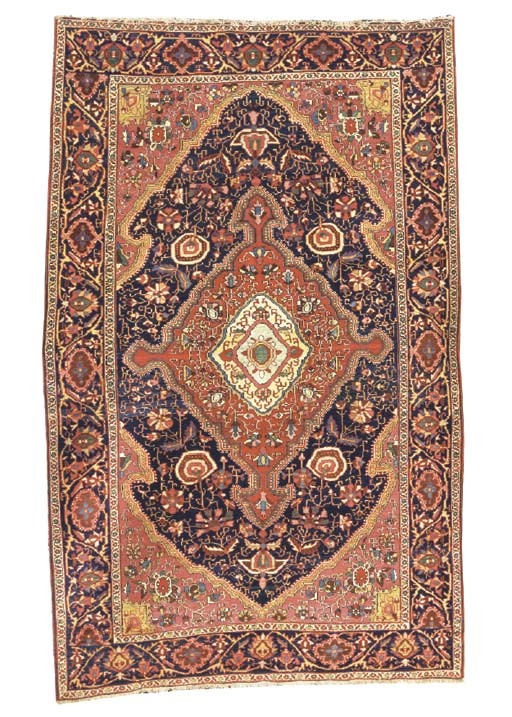 As with all the Arak Rug types the names are more of a grade than an exact place attribution. 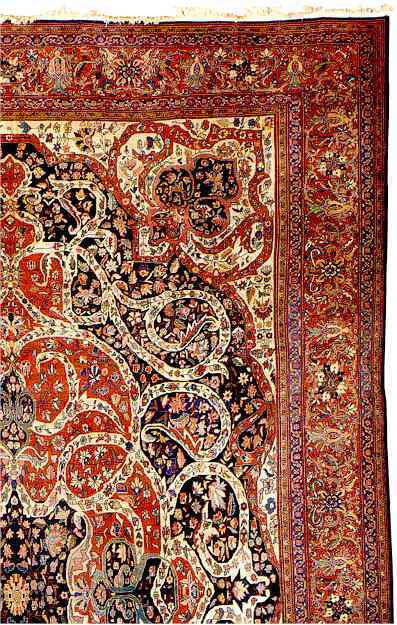 Prior to the introduction of the American Sarouk these carpets represented the best of the Sarouk production. 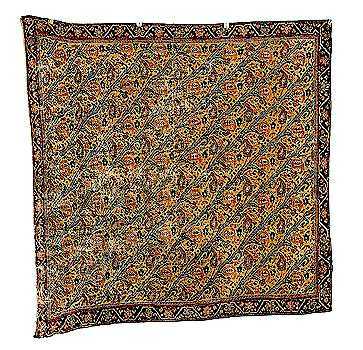 They were attributed to the village of Feraghan but were likely made in a number of villages. Once the American Sarouk took off these began to disappear. These pieces are highly desirable in today's market and this one sold for just over 500 dollar per square foot ($74,000) at Sotheby's New York, when it went up for auction in 1998. 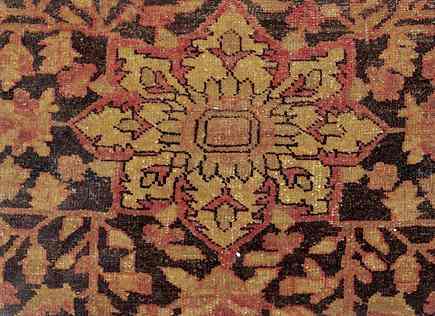 These pieces are very similar to the Mohtashem Kashan rugs in handle and structure. 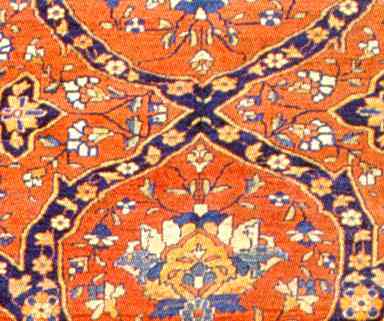 An attribution clue is that that Mohtashem Kashan carpets have lavender silk selvages. Warps: Cotton 6 strand. Undyed (white). 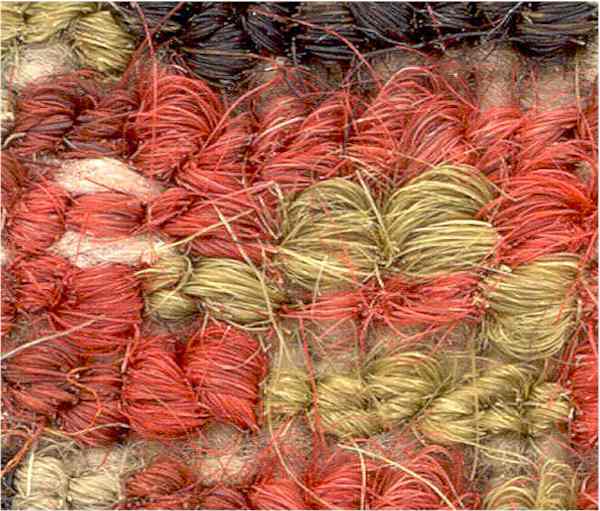 Wefts: 1 rigid and 1 sinuous weft. Selvage: Surmey blue wool wrapped around 3 warp units. Farahan, Persia. Circa 1870 - 1880. 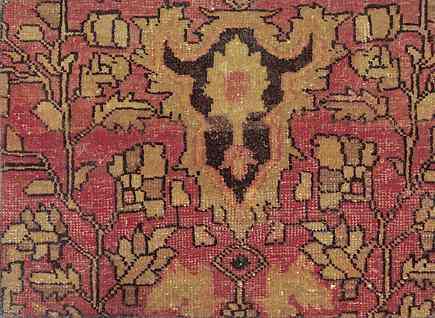 This is about 1/2 inch across of the rug magnified. Warp: 4 ply to 6 ply cotton. 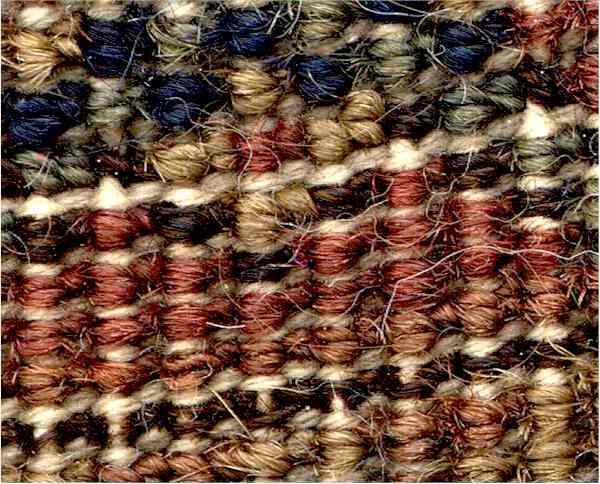 Weft: 2 shots 3 ply white cotton small area of 3 ply blue in sample rug..
Ends: not original in sample. Selvages: reinforced selvage 2 warp units reinforced with extra maroon selvage yarn. Further Notes: Areas of corrosion, black and celadon green. Areas if apple green showing no corrosion. This is about 3/4 of an inch across magnified. 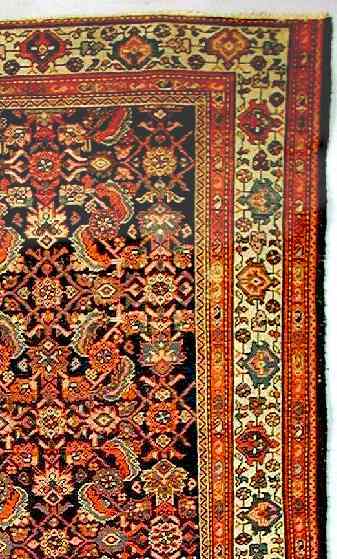 Farahan Sarouk, Persia. Circa 1900 - 1910. Weft: 2 shots 8 - 12 ply white cotton. One shot rigid and one sinuous. Selvages: attached interlaced selvage 1 warp unit wrapped with extra maroon selvage yarn. Further Notes: Areas of corrosion, brown. Areas if apple green showing no corrosion. 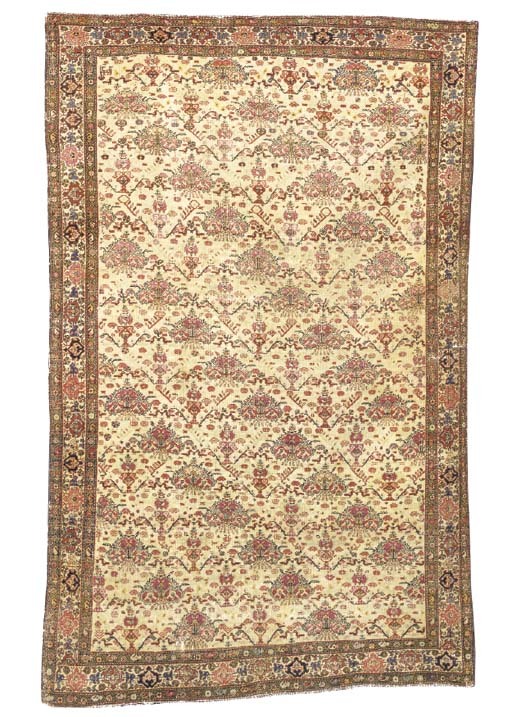 Origin: West Persia, Arak region, late 19th c.
Low pile with larger re-knotted areas, sides overcast. Fringes at both ends not original. 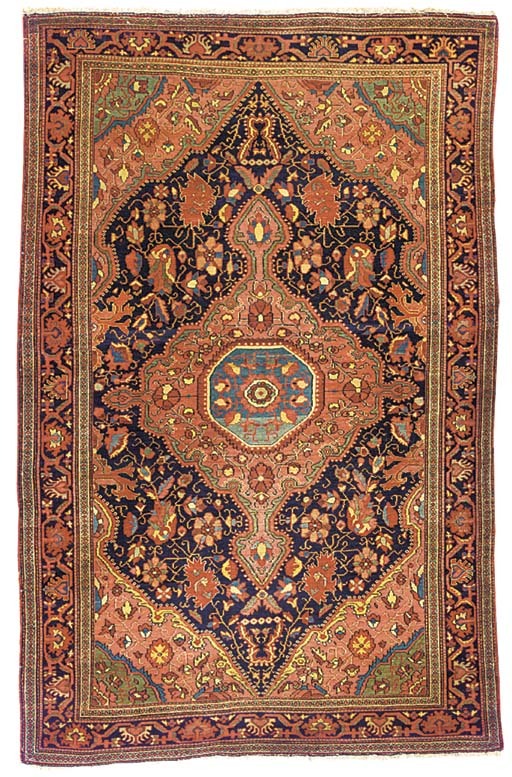 North Persia, Late nineteenth century. Persia. Late 19th/early 20th century. Knotted pile. 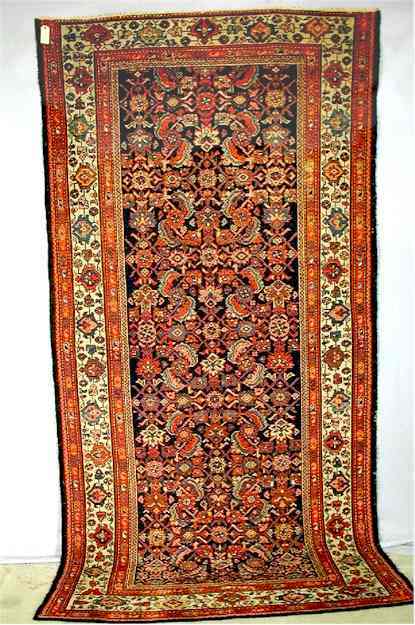 42" x 58"
This small carpet, with its tight weave and high knot count, is in very good condition. Abrash in the colors, from dye batch changes, enriches the palette. 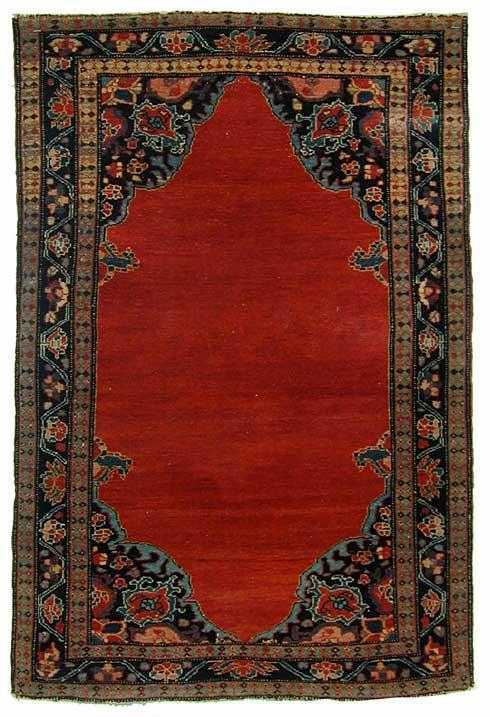 As this is not a 'tribal' rug or kilim, it's a bit out of place in this group. Note the light pinkish red in the center of the medallion. It is doughy red which I understand was madder with yogurt added to soften the color. 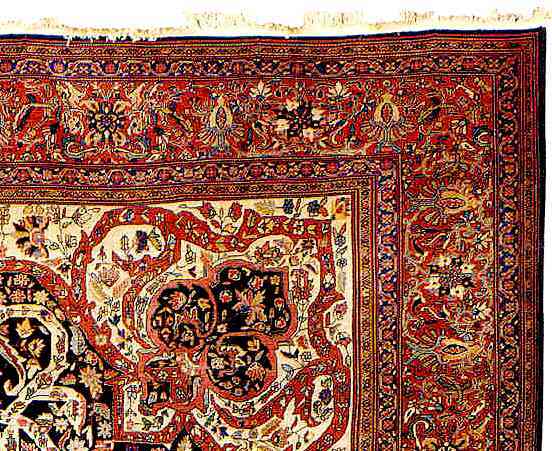 Notes: This is part of the broader group of Arak Rugs. Up until W.W.II these carpets represented the best of the Sarouk production. 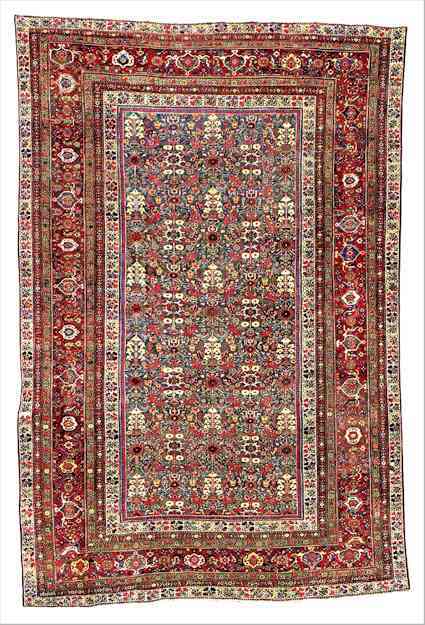 They were attributed to the village of Feraghan but were likely made in a number of villages in the Province of Arak, Iran (old name Persia). 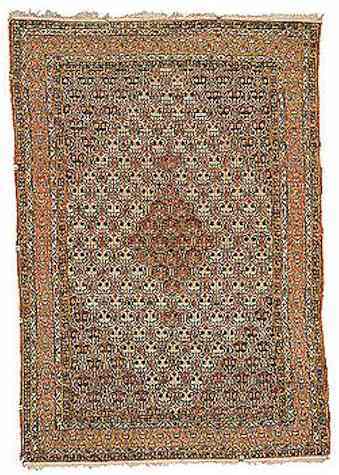 Fereghan-Sarouk Prayer Rug, West Persia, late 19th century, (slight even wear to center, minor rewoven end areas), 7 ft. 2 in. x 4 ft. Size: 19 ft. 8 in. by 16 ft. 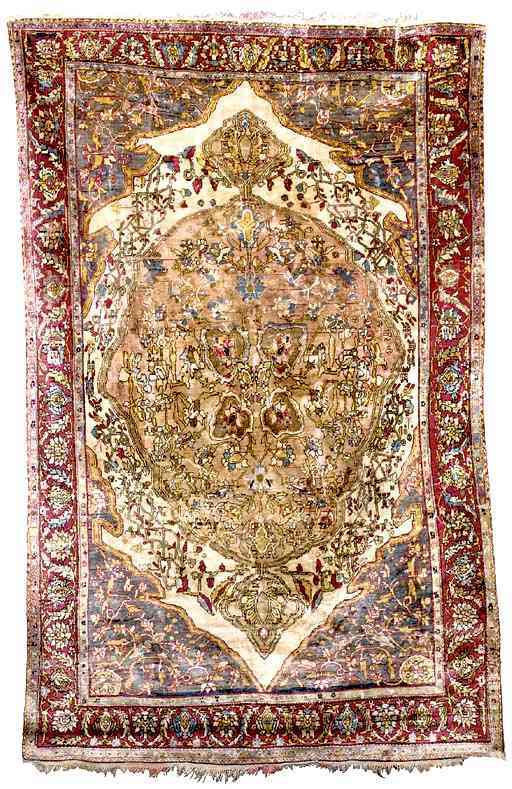 Description: The rug features a blue-black herati field with pale yellow and green bird-filled spandrels. It has a pistachio turtle palmette border with oxidized browns and greens, minor partial ends, and fabric strip sewn to reverse. 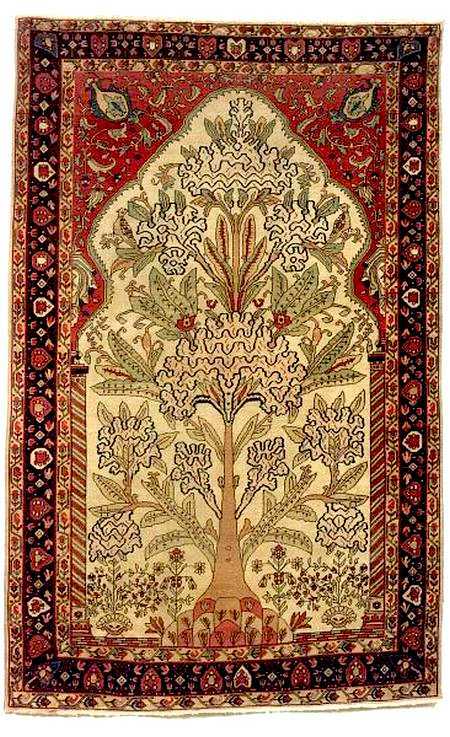 This is part of the broader group of Arak Rugs. Up until W.W.II these carpets represented the best of the Sarouk production. 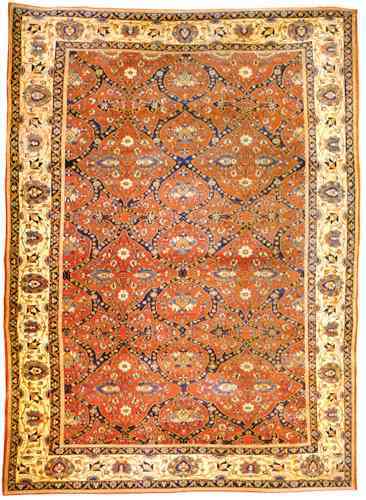 They were attributed to the village of Feraghan but were likely made in a number of villages in the Province of Arak, Iran (old name Persia). Size: 4 ft. 1 in. x 3 ft. 11 in. Size: 9 ft. 6 in. x 4 ft. 9 in. Description: Slight even wear overall; outer guards missing on top end.